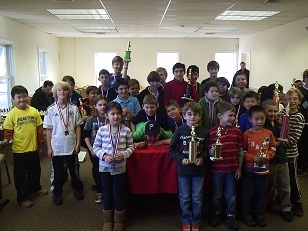 We had a high turnout for this year’s President’s Day Scholastic tournament, with a total of 35 players spread evenly into three sections. The youngest group was won by Ambika Grover with a perfect score. Also putting in solid results and tying for first were Aalok Bhattacharya, Halsey Robinson and Cooper Consiglio. 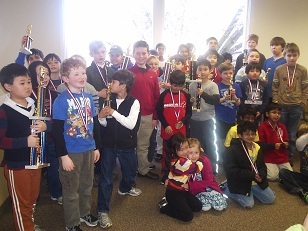 For the first time in one of our scholastic tournaments, there was a four way tie for first! The co-champions included Jason Lessing, Brent McCreesh, Ethan Vayda and Benjamin Filler. In one of the toughest scholastic sections we have ever had (8 of the 14 players were rated over 1000), Zachary Filler won clear first with 4/4 in the 6-8th grade section. Close behind were Henry Stratakis-Allen and Harry Saunders who both finished with 3 points. This tournament was particularly notable for the exceptional sportsmanship demonstrated by all of the players. There were few disputes during the games and everyone was very gracious both in victory and defeat.